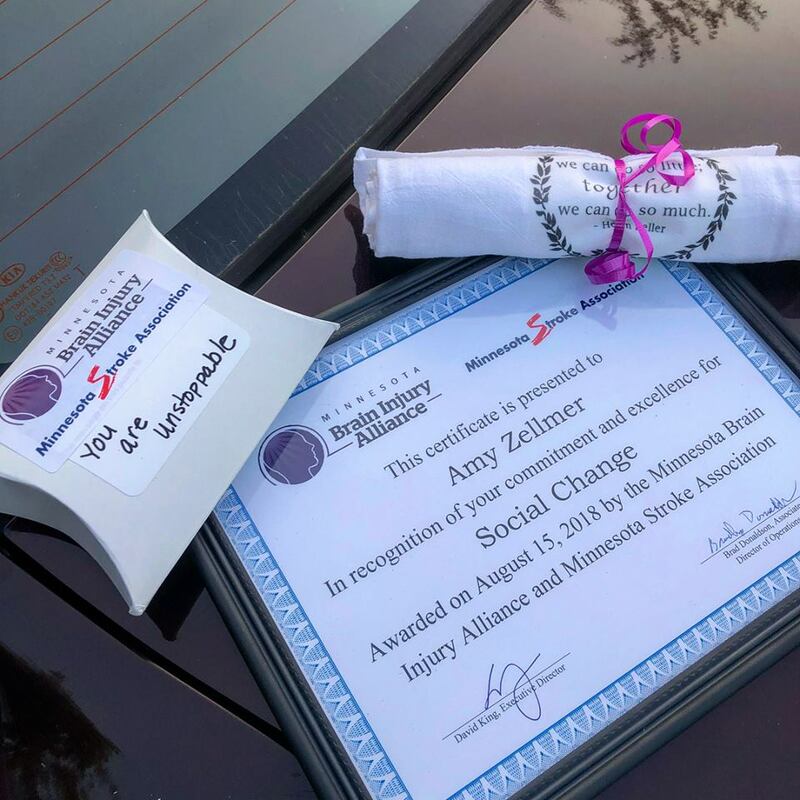 Last night was truly such a surprise and incredible honor as I received the award for “Social Change” from the Minnesota Brain Injury Alliance. I was awarded this by Jeff Nachbar, head of the Public Policy division. 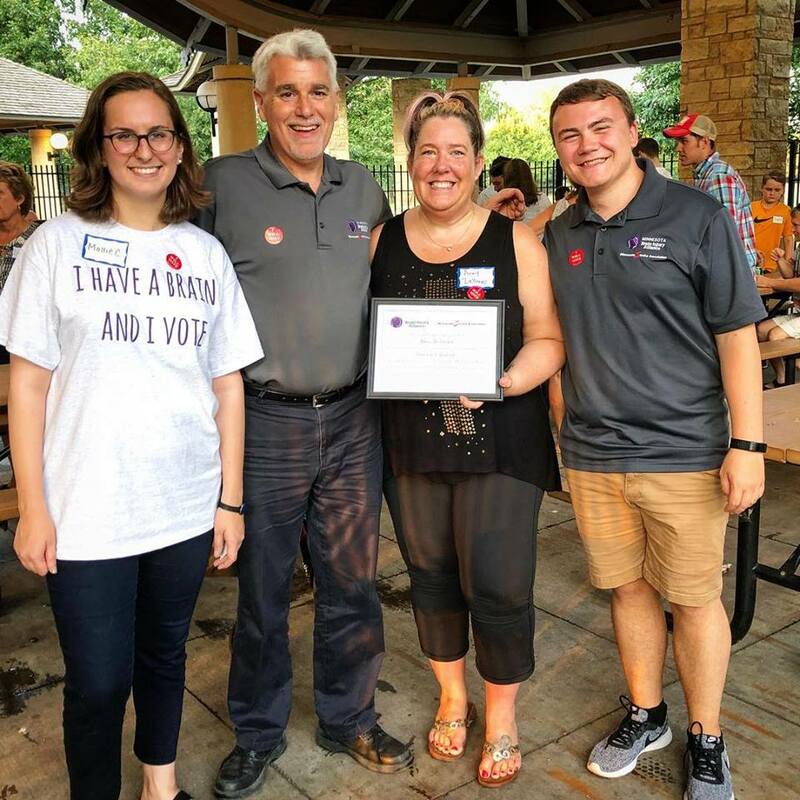 I have worked closely with Jeff and all of the Citizen’s Advocates over the past three years as we rally at the Capitol and attend “Tuesday’s at the Capitol” every Tuesday during session. It has been such a joy to get to know Mollie and Zack who replaced Erica when she moved on — and I do have to give a shout-out to Erica. She is truly the one person that reached out and kept me coming back to the MNBIA!! Jeff has taught me pretty much everything I know about politics and how public policy works. He took the time to answer all the questions I had (and I had a lot) and would happily repeat the answers when I asked the same questions over again! I have learned how a bill is created and turned into policy and how a budget is approved and appropriated for. He also gave me a crash course before I headed to Washington DC last June where I lobbied to save Medicaid (MA, Medical Assistance). It was truly exciting to see the bill get voted down while I was in DC — and I also gave a rally talk at the MoveOn.org rally on the Capitol lawn! This February was truly an advocacy highlight when Jeff asked me to be the closing speaker at our “Disability Day at the Capitol” rally as we kicked off the session and disability month. I know that what I am doing is creating change in the world, and helping survivors realize they’re not alone — and hopefully helping the healthcare profession understand more about this invisible injury that affects over 3.5 million American’s each year. I was given this award in recognition of all of my efforts to raise awareness across the globe through my podcast, TBI TV, brain health summit, Huff Post articles, books, and traveling across the country speaking to support groups and keynoting at conferences. I have made some truly incredible friends during all of my advocacy work, and I wouldn’t trade this journey for anything! I do everything I do out of a passion to create more awareness so that others don’t suffer alone the way I did — I want to get resources into the hands of survivors and caregivers sooner rather than later. If sharing my story can change just one person’s journey — it is worth all the blood, sweat, and tears!! Such a Well Deserved Award Amy! I can’t think of anyone else I know that deserves this more, truth. This Brain Injury Survivor has been helped time & again by you!!! HUGS Sis! Keep up the great work! It is awesome to see you be recognized for the informative work that you do! Well deserved! Thank you, Bob! Your support means so much to me!